James Prance of Sunbury on Thames passed his practical driving test today 25th Nov 2016 at Ashford test centre on his first attempt. It was truly worth all the effort into learning the skills of the road. I wish you all the best & “Safe driving for life”. 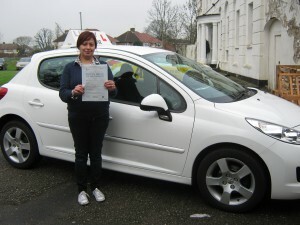 What a great result with Angela Gomez passing her practical driving test today on her first attempt at Isleworth test centre. I wish Angela many years of safe driving. 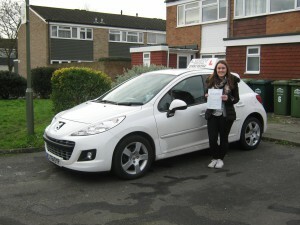 Saskia Marr from Sunbury on Thames passed her practical driving test at Ashford test centre. 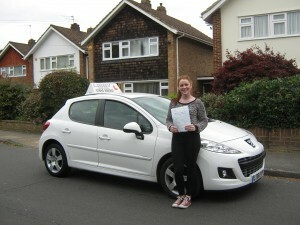 I would like to congratulate you Saskia on a brilliant performance on the day with a first-time pass with only 4 minor errors. You worked hard for this result & it all paid off. Your friends will be so proud of you. 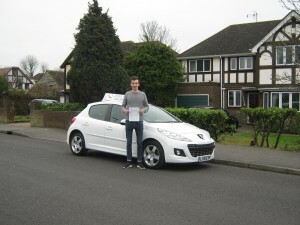 Matt Smith from Chertsey passed his practical driving test at Ashford test centre with flying colours. He passed with only 3 errors on his first attempt. Well done to you Matt, a great achievement in a short period of time.. I wish you many years of safe driving. Alice Brandon of Sunbury On Thames passed her practical driving test on 14th April at Ashford Test Centre. What a star passing on your first attempt & what a wonderful feeling knowing the hard work has paid off. So pleased for you & so proud. Adele Wreford of Isleworth passed her practical driving test today .Your standards were high & you proved this as you passed on your first attempt with very few driver errors. 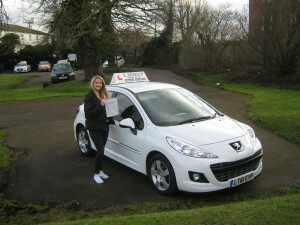 I was very happy to have taught you how to drive & I wish you many years of happy motoring. 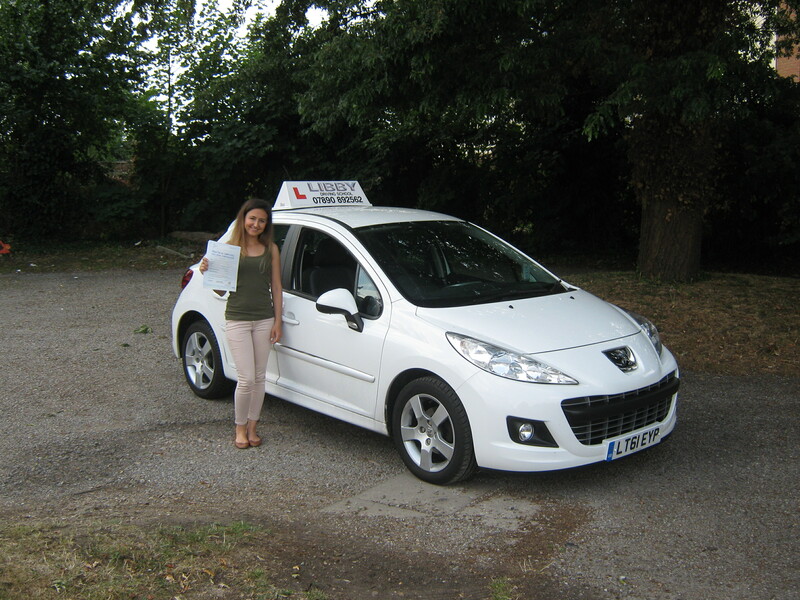 I hope to see you out on the road in the near future..
Kendall Knight from Sunbury On Thames passed her practical driving test today at Ashford test Center. 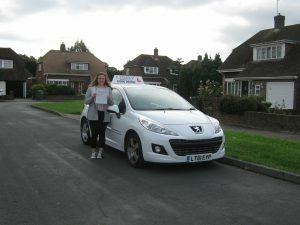 What a result to pass with only 2 minor errors on your 1st attempt. Congratulations to you Kendall. I wish you many years of safe driving..It was a pleasure to have taught you how to drive. All the best..Libby. 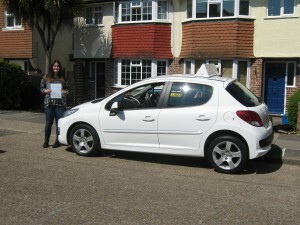 Fatmacar passed her driving test at Isleworth test centre on Tues 18th Aug. It gives me the greatest pleasure to make this announcement. 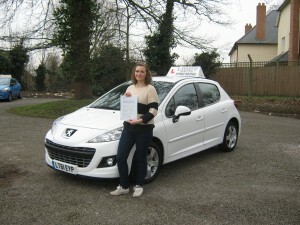 Fatmacar showed me she was determined to get her licence & she showed the examiner on the day that she meant business.. 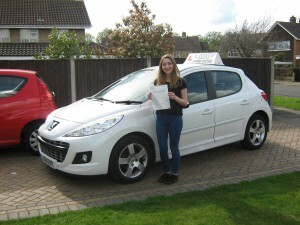 I would like to congratulate Hattie for passing her practical driving test on 17th July at Isleworth Test Centre. She passed with only 3 driving faults. 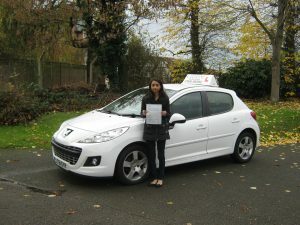 I am very proud of your result & happy to have taught you how to drive. All the best for the future. 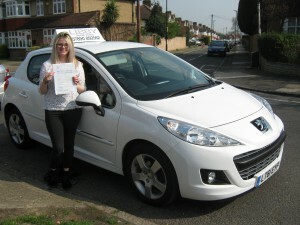 I would like to congratulate Charley Ridgers of Twickenham on passing her practical driving test at Isleworth test centre. 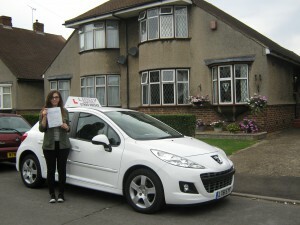 This was an excellent result & a first time pass with only 3 minor errors. It was easier done than what you thought. We worked together as a team to gain the result of an excellent pass. This is a life skill which was worth all the effort you have put into this to achieve this result. It was a pleasure to have taught you how to drive. I wish you “Safe Driving for Life”..
Another one down 1 more to go in 2 weeks time..
Barbara Warren passed her driving Test on friday 20th March @ Ashford test centre. 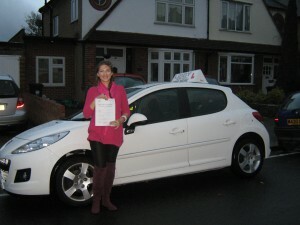 Congratulations on receiving your pass certificate Barbara. I was delighted to hear such good news, you deserved this result. Now to buy yourself a set of wheels or a Camper Van as you have so wished for such a long time. Keep up the skill & “Safe Driving for Life”. 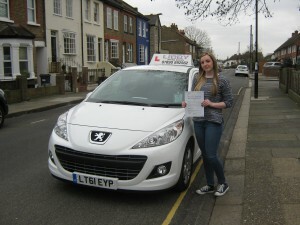 Emily Berry of Twickenham passed her practical driving test at Isleworth test centre. Please join me in congratulating Emily with this wonderful test pass. 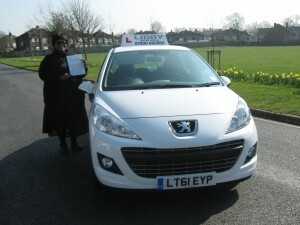 She cruised along on the day & passed on her first attempt with only 3 minor errors. Emily completed the circuit with ease & showed the Examiner her determination to succeed on the day. Her certificate now firmly in place,she now has “The Freedom Of The Road” You are a Star. 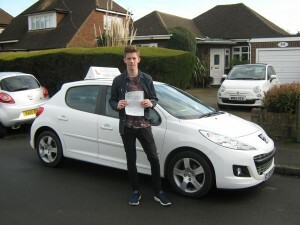 Sam Day from Sunbury On Thames Passed his practical driving test today at Ashford Test Centre. Geoff the Examiner commended him on his drive at the end of the test. 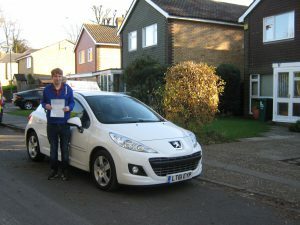 Congratulations to Sam for his brilliant efforts throughout the test as he passed with Zero Errors on his marking sheet. This is not something which happens every day. I was delighted to hear such wonderful news. I wish you all the best for the future, it was a pleasure to have taught you how to drive. Will Ewing of Sunbury on Thames passed his practical driving test at Ashford Test Centre. 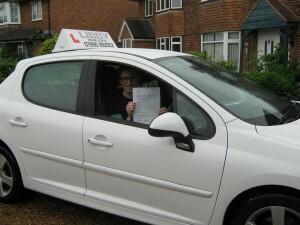 Congratulations Will you passed it on the first attempt with only 2 minor errors. All the hard work paid off with such a great result.. I wish you many years of stress free driving..
Sass Gilmour of Twickenham has successfully passed her practical driving test with ease at Isleworth Test Centre. on her first attempt. She made it look so easy & passed with flying colours. I was so proud to see that Test Certificate.. Well done Sass..
Error: Error validating access token: Session has expired on Monday, 25-Mar-19 02:27:01 PDT. 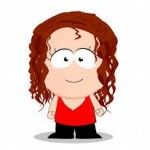 The current time is Saturday, 20-Apr-19 19:24:29 PDT.